An easy and delicious cheesy gluten-free bread with its roots in Ecuador. 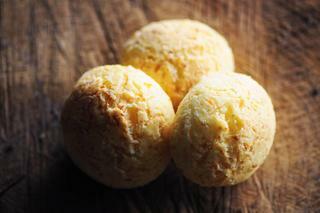 Pan de Yuca will become a dinner table staple in no time! I first encountered Pan de Yuca when I first entered Ecuador by bus--smack dab in the middle of a year long journey that began in Costa Rica. I lived in the small village of Peguche for 3 months, visiting the markets of neighboring Otavalo a few times a week. Pan de Yuca was one such thing that stuck with me from those visits, as I absolutely fell in love with Yuca (not to be confused with Yucca), finding myself eating it nearly every day just about any way you could buy it or prepare it! Yuca, also known as manioc or cassava, is an amazing tuber that cooks similarly to potato but has a unique and satisfying flavor all of its own. I was delightfully happy to discover that here in the states you can easily purchase Tapioca starch/flour, which is the powdered form of this much loved Latin American root. While traditionally made with freshly made queso blanco in Ecuador, I chose to make it with a blend of feta & parmesan for an extra dose of cheesy flavor, as I am a self admitted cheese fiend! But, if you would like to be more traditional, you can make this with queso fresco instead (easily found here in the states). This bread is so very wonderfully chewy and cheesy, and whether or not you adhere to a gluten free diet, I promise that you will be amazed by this easy & tasty bread!!! Preheat oven to 400°F. Line a cookie sheet with parchment paper, set aside.In a large mixing bowl, sift together dry ingredients.In a separate bowl, mix wet ingredients & cheese until evenly combined.Pour wet ingredients into dry ingredients and stir until smoothly combined. Let batter sit for a few minutes.Knead dough until you have one smooth round ball. Divide dough into 12 rounds.Place rounds on your parchment line baking sheet & place on the middle rack of your preheated oven.Bake for 20 minutes, then turn on the broiler and broil for 10 minutes or until firm & beginning to brown.Best served fresh & warm--but also stores well in the fridge & reheats well in oven!Enjoy!